The smartphone users of Bangladesh have, no doubt, become a great fan of Walton. For the last few months Walton has stolen the hearts and the money of smartphone lovers. Although, Symphony is still in the lead but in terms of market share, they are falling behind. The recent release might be a game changer as they have announced some brand new smartphones recently. For the last few days most of the Android fans in Bangladesh became excited to see the budget friendly Moto E and Micromax Elanza 2. The main reason behind it was the specs and the price. In terms of that Symphony just joined the club. Reason? Their previously mentioned product Xplorer W70Q just got it price update. And this price tag of 6,690 BDT made it more attractive than ever before. Of course there are several smartphones from many manufacturers in Bangladesh in this price range. So why did the price of smartphone make it more attractive? What made symphony different is the specification of the device. The phone packs a Snapdragon 200 Quad Core Processor along with Adreno 300 (It should be either 203 or 302). Now if we assume that the GPU is the Adreno 302 then the processor will mainly be a Cortex A7 architecture which is good enough for a smartphone. Also, that’s exactly the same processor you will find in Micromax Elanza 2. This is the part that made it all different from the rest. But that ain’t the end of it. The device also features a 4 inch IPS WVGA (480×800) display, 512MB RAM, 4GB ROM, MicroSD Slot, 5MP rear with LED flash and 0.3MP front camera. It will run on a 1500mAh battery and Android 4.3 Jelly Bean. 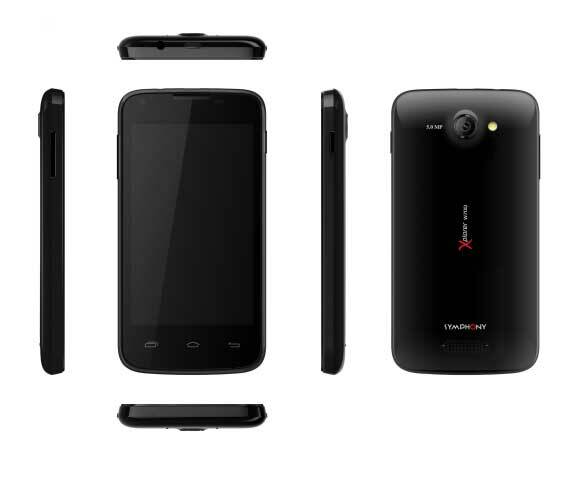 It also comes with the usual 3G, Wifi and Bluetooth support which makes a pretty ideal budget friendly smartphone. Still we will have to wait for a formal review before we decide if the phone is good or not. Our main concern about the device is the RAM. Since the device runs on Android 4.3 Jelly bean (which uses up a lot of RAM) we wonder how well it will perform with only a mere 512MB RAM. Currently there is no way to tell it so we will have to wait for that. Till then this is a question for our valued readers, are you eager to buy this smartphone?